Teachers from CedarBridge Academy where Nahge O’Brien was a student yesterday paid their own tributes to the popular pupil. Roshanda Caines, S3 Guidance Counsellor, said: “Nahge represents all that was good about his family, friends and his school. “His cheerful optimism in the face of his difficult circumstances was just a small indication of the beautiful person that he was. Janet Le Page added: “Nahge O’Brien will be sadly missed in the classrooms and hallways of CedarBridge Academy. Phyllis Harshaw told the Sun: “As one of Nahge’s teachers at CedarBridge Academy, I am honoured to have known and worked with Nahge. “He was motivated to be successful in school and worked towards this goal. “A well-mannered, polite and a quick-witted young man, these were always a part of Nahge’s personality. English teacher Stephanie Castro provided an acronym of Nahge’s name. FRIDAY, APRIL 27: The heartbroken parents of a teenager who died of cancer have spoken of their enormous pride in their brave son. Morris and Margaret O’Brien were at Nahge’s bedside when he passed away at the weekend after a 16-month battle against leukaemia. Talking to the Bermuda Sun from Memphis, where Nahge had been treated since last November, the couple paid tribute to their 16-year-old son for never complaining and always thinking of others. Mrs O’Brien said: “Even while he was undergoing intense chemotherapy and radiation treatment he was always thinking about how he could help other people. “When we were at Boston Children’s Hospital, just after he had been diagnosed with cancer, there was another teenager on the ward from the Dominican Republic. The child did not have his parents with him and he was worried about chemotherapy. “Nahge decided to go into his room and talk with him. He stayed with the boy often and they became good friends. “That was typical of him. Even though he was suffering you would never know it and he would always put other people first. “He never seemed to be scared of what was going on around him. “He would just say to me ‘what will be will be’. Mr O’Brien added: ‘I was so impressed with his courage and the way he dealt with all the challenges that he faced. “It makes you proud to have a son like Nahge. “He would always wear his Sesame Street pyjamas and take his iPod when he went down for the radiation treatment. “So on the last day of the treatment all the doctors and nurses dressed up in Sesame Street clothing. 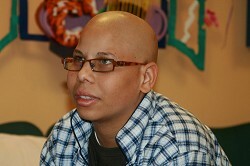 Nahge was diagnosed with cancer on December 26, 2010. He was treated in Boston Children’s Hospital at the beginning of 2011, but had to return again in October when tests revealed he had relapsed. Last November the teenager was moved to St Jude Children’s Research Hospital in Memphis to undergo more chemotherapy, radiation and a stem cell transplant. The transplant took place on March 12 and Nahge seemed to be making good progress again. But he was struck down by a virus soon afterwards and admitted to the Intensive Care Unit on March 25. He never came out of ICU and passed away on Sunday afternoon at 4:55pm. Mrs O’Brien said: “The hardest thing was seeing him in the hospital bed after March 25 and not being able to do anything. “He could not really talk and he got frustrated because he was not able to speak to us. “So we would use signs like blinking and squeezing each other’s hand to communicate. “Morris and I would take it in turns to be with him when he was in ICU. “It was so hard to see him like that. “He was the most caring, loving and positive child and he was always trying to look out for everyone else. 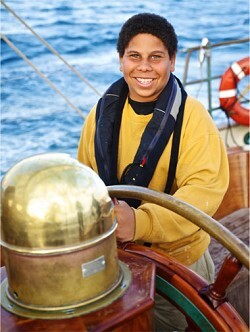 His father added: “All he wanted to do was get back on the Spirit of Bermuda. “He loved sailing so much and he would follow where the Spirit was and say he wanted to be there. “During his treatment Nahge discovered what it was he wanted to do in life. “He told me he wanted to be a Child Life Specialist and encourage other patients in a similar condition to him. “He leaves a big hole in our life now and lots of other people’s lives too. The couple hope to bring Nahge back to Bermuda on Wednesday and are making preparations for his funeral on May 6.